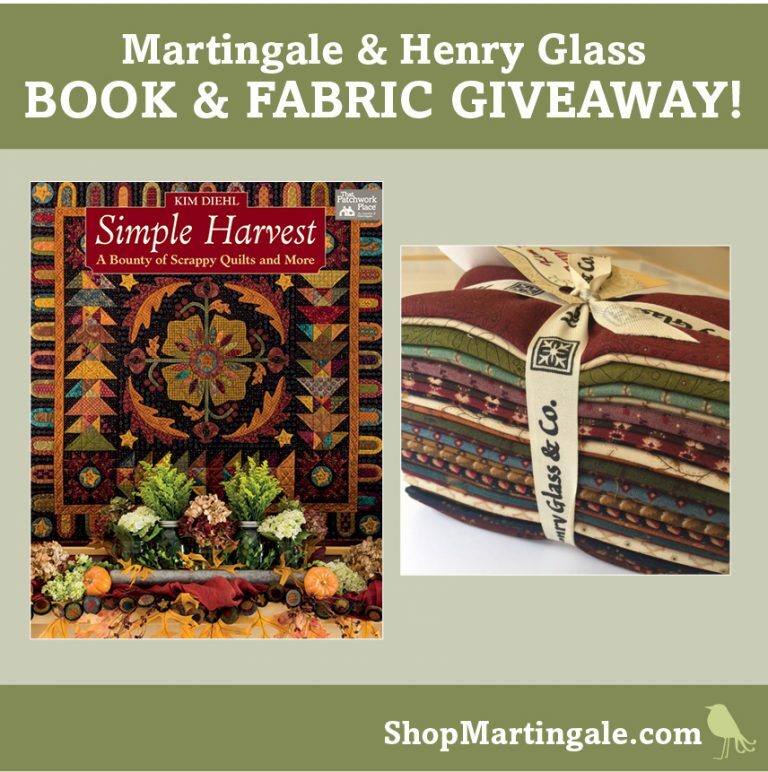 Henry Glass Fabrics: Henry Glass Designer Kim Diehl launches a new book and we launch a new giveaway! Henry Glass Designer Kim Diehl launches a new book and we launch a new giveaway! It's Autumn! What better season than to fall in love (again) with the talents of Kim Diehl than her favorite season! 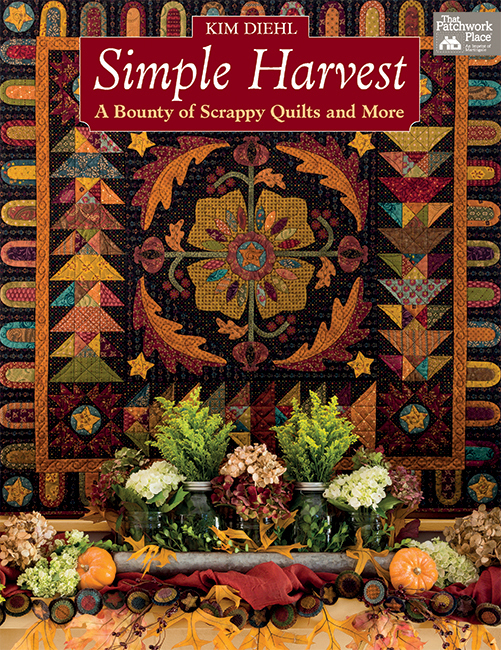 And to give fans of Kim Diehl a little gift from her heart is the launch of her 11th book, "Simple Harvest." All the fabrics in the book are from Henry Glass. Go read a special guest post written by Kim Diehl on Martingale's blog. You can enter to win a book and a bundle on that blog, and you can enter to win here too, by posting your heartfelt comments for Kim Diehl's talents on this blog. Here are some gorgeous scenes from her book "Simple Harvest." OUR CONTEST WINNER IS JOYCE CARTER of GEORGIA! CONGRATULATIONS! When I think of Kim Diehl, I think of beautiful shapes and quilting. Her colors are always spot-on and remind me of home comforts and snuggling up with the warmth of a quilt made with loving hands! They are always so beautiful! Everything Kim makes is beautiful! And the colors of her fabrics are gorgeous! Kim's work and designs are gorgeous!! Putting this on my wish list!! autumn is the perfect time to release this wonderful line - the colors are so vivid and the patterns are outstanding. Kim has such a great eye for color and design, her patterns are unique and distinctive without being modern or clunky. I've enjoyed Kim's books for years and this one will be full of more lovely designs, I'm sure. Can't wait for it!! Oh my gosh, Kim has such a goodt eye for design and color! Her quilts are a visual delight that draw me in every time I see one either online or in one of her books. Congratulations on her newest publication. I can't wait to see it! I love Kim's books and fabric! I can't wait to get my hands on a copy of her latest book! Another winner, by the looks of it! I love Kim's books and fabric. She has a great talent of which colors and designs to use together. Lovely projects from a talented designer. I love the colours and designs of Kim's fabric lines. So beautiful! Lovely designs and I really like warm colors. I've always loved Kim Diehl's style and the colors of her fabric are so unique! 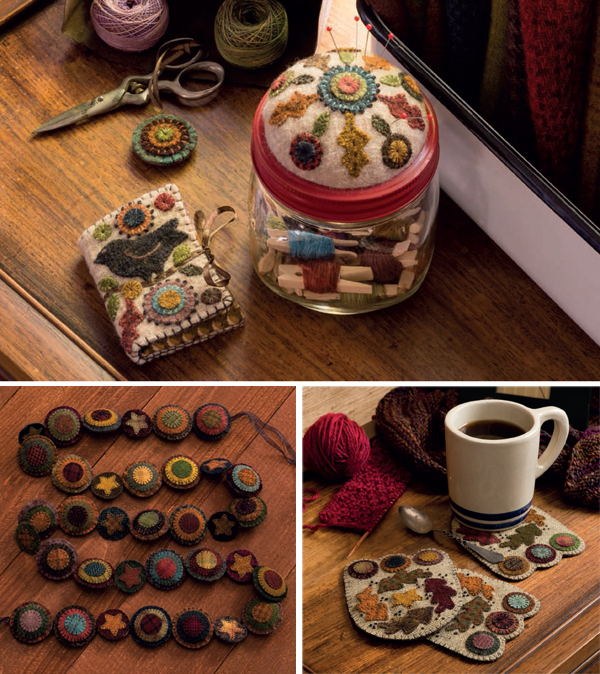 Kim Diehl has such a beautiful eye for color, in addition to the warmth and charm of her designs. This combination makes her books a joy to read and her designs so satisfying to recreate. Kim - you have such a definite way of bring the home tradition back to life! Such warm and cozy quilts you create! Love, love, LOOOOOVE Kim Diehl's Books & Fabric Collections!! She designs the most beautiful blends of colors, and her Patterns are perfectly matched to every shade! The wool needle book with bird is an extraordinary piece of art. Love the embroidered details. I have a few of Kim Diehl's books and love her designs! I would love to have this one too! Truly love the colors and designs she has created. I love applique...wonderful projects and would love to have this book so inspirational. Wow! That quilt on the fence is stunning! Lots of great projects you've shown. As always, Kim's quilts are fabulous! I have never met a Kim Diehl fabric or quilt that I didn't love! I am excited to get her new book. Thanks for the chance to win. Really love everything Kim Diehl designs!So pretty! Yes! Another beautiful book. I love her quilts and fabric, it will be difficult to choose one to make. Thank you! I love all things from Kim Diehl. I have just about all her books. Thanks for the chance to win Kim's new book. Beautiful designs, makes me want to set aside what I am working on to work on these instead. I seem to gravitate to Kim's books. The first thing I see is the book cover full of beautiful deep colors, then after opening it you're overtaken by appliqué, piecing, cotton, wool, colors and shapes! It's like all my favorite things together in one place. What could be better than that? I am a collector of all things Kim, books and fabrics. I am working on a scrap quilt now using her various collections. Keep up the good work. Kim's colors and designs are just so homey and relaxing to look at. Very comforting. Great job. Thanks. Kim is one of my favorite designers, I love the way she uses color, value, and shapes. She is just amazing. I have alwayw loved Kim's designs. This book promises not to disappoint. As so many others here have said Kim IS one of my favorite designers. Her designs represent what is "home" better to me than most others. Her use of color, shape and design are outstanding. I love her combinations of piecing and applique....not quite primitive yet not too complicated. I have never seen a Kim Diehl fabric or pattern I didn't just love. Thank you for a chance to win. Kim's quilts are so well done. Colors are beautiful and the small pieces create such detail..
My most favorite pattern and fabric designer of all time! Her color choices, designs and style just sing to me. WTG on another successful book and line, Kim! Kim Diehl’s fabric and patterns are my favorite of all time. They represent comfort and beauty to me. I've always enjoyed seeing Kim Diehl's work and books. Looking forward to this one. Whether a pieced quilt or appliqué, Kim has an artist eye for color and design. Her fabric choices are flawless, warm and cozy. There are projects for every ability in this book and I can't wait to get my hands on it and get started! I have all of Kim's books because her designs are so easy for everyone to do but yet challenging. Her colors are so warm and inviting. Looking forward to having her new book. Oooooo, I love all things Kim! I have all of her books and look forward to getting a gander at this one! 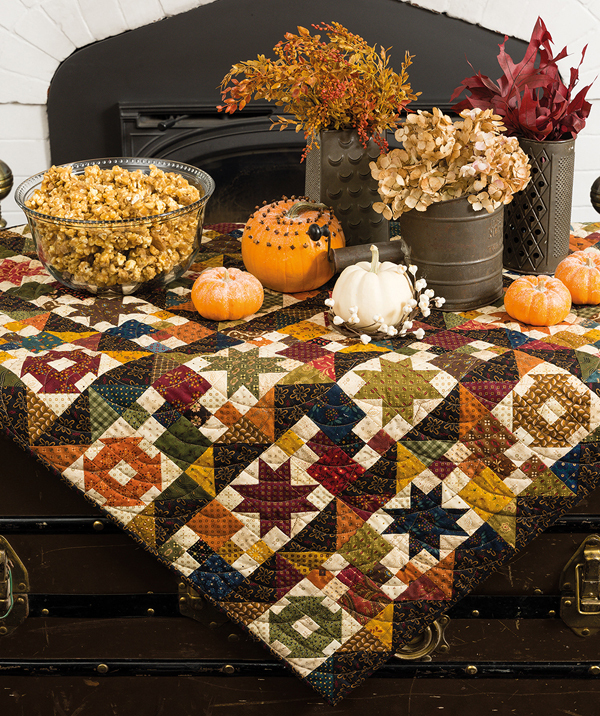 Kim's use of color and print and her beautiful quilt designs seem to meant for autumn! Kim makes classic looking designs come to life with her beautiful work! I haven't worked with wool but this book makes me think I should try it. Kim Diehl is blessed with such great talent! Kim's colors are so rich and evocative of autumn--perfect for this time of year. And her designs are just beautiful! Kim's colors & designs are amazing! So deep & rich! I am totally in love with AT LEAST 2 of Kim's larger projects (the Dresden and the Harvest Tapestry), those colours have such depth and lustre . They sit perfectly together. Such talent and imagination. I'm another die-hard Kim Diehl fan. Love her designs and love her fabrics. I was luck enough to get into one of her classes, which only added to my admiration of her. I'll add this new release to my library and hope she continues to produce this style that we all so love. I love Kim's quilt designs and fabric lines. The new book looks great. Nancy, you had me at Simple Blessings! I have used that book so many times, it is falling apart. But I would never get rid of it. It is one of my favorite books, of which I have many. I have been a big fan ever since I first saw your work. Your books are beautiful, fabrics gorgeous, designs superb! Thank you for brightening my quilting life. Kim's quilts are beautiful. They always look so full of warmth in all the beautiful fall colors. Ms.Diehl creates some of the most charming motifs and patterns. The fabric used here are glorious too. My favorite colors, Autumn. I've made a few of Kim's "Simple Whatnots" quilts and I just love both her fabric lines and patterns. Thanks for the chance to win! 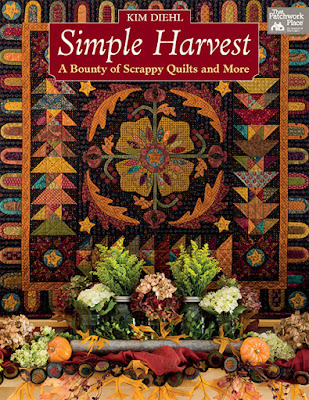 Kim's quilt are just beautiful and this book looks fabulous! I took a class with Kim a few years ago and she's just a doll. I loved learning from her. Kims colors are my favorite colors also!! Love the fall feeling of in her books and fabric selections. I have always loved Kim's work! I just love her style and her designs! Absolutely love the warm tones of these fabrics!! Kim knows how to make them shine with her attention to details and Beautiful workmanship! Kim’s selection of colors and fabric prints compliment her designs! Love all her books! I have recently been introduced to Kim Diehl’s books and fabric. I fell in love with both her quilt designs and fabric, I am starting to collect her fabric collections. Kim's patterns/books and fabric are do special and designed with love. Love your fabrics, colors and unique designs! The colors are so bold and work so well together. Kim's designs are gorgeous. She definitely puts a bit of herself in each and everyone. Lovely fabric sure this is another great book with projects to make with the fabric. All of Kim's Quilts have such beautiful fabrics & designs. She is so talented! Sew many potential projects, so little time! Love Kim's fabrics, and designs! Best Applique Freezer Paper too. I can't wait for get my hands on a copy of this book. Love, Love, Love all things, Kim Diehl!! Her colors and patterns are beautiful additions for my home!! Thanks for opportunity to win yet another great book of hers!!! Definitely my coloway, is what Kim works with. Love her fabrics and her books!! I have done Kim's Simple Whatnots, and enjoyed them tremendously. Love her colors. Love Kim' fabrics. Have enjoyed doing her Simple Whatnots club patterns. Look forward to looking at her new book. She is wildly talented and her work is amazing! Her fabrics as well as her quilt designs are stunning. I love Kim's projects and fabrics! I always get the most wonderful compliments on the projects I make that she designed. I love the beautiful, rich colors and the beautiful details in Kim Diehl creations! Love love love your books and fabrics... eye candy...each project is drool worthy! I love Kim’s quilt designs and colors. Would love to win this bundle. I love the fall time of the year. The patterns and fabrics here are perfect for fall projects. 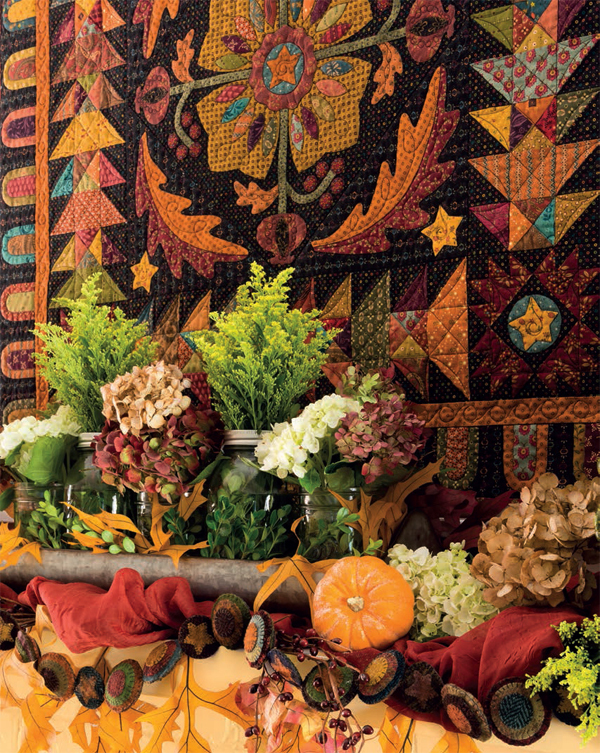 Nothing says FALL like a bundle of Kim Diehl’s Fabrics. I ❤️ this line of new fabrics and can’t wait for this book! Thank you! Love the projects shown! Can't wait to see this book in person! Thanks! Love your fabrics and books. Can't wait to see this one. I've never won anything. Maybe this time I'll be more lucky. I love everything Kim Diehl! Her patterns are always awesome and her fabrics are just the right colors to give that nostalgic look. Thanks! Love Kim Diehl's, books I have them all, would like to add this one to the collection. I have taken several classes with her in the past, loved every minute of them. Lovely book! The fabrics & projects are all beautiful. Love the fall colors. have never met a Kim Diehl fabric or quilt that I didn't love! I am excited to get her new book. Thanks for the chance to win. Kim's fabrics are beautiful and her designs are unique. Love the country colors. Nice fall fabrics and patterns. Thank you Kim Diehl for sharing such fun. I love Kim's books because she is so down to earth with her beautiful quilts! They are traditional (which I love!) and every quilt is so different from anything you have ever seen! Kim's books are like a friend coming to visit you and you get to sit on the porch and talk, laugh and quilt a while!! Kim’s designs and fabric choices are eye candy! 😻. Wow to have such awesome creativity inside! Kim is very talented and I think she has a great eye for detail and color. I might have goofed so hope this didn't post twice. Thanks for the fun. Kim is an amazing artist. I love her fabric collections and her books are absolutely amazing. She is one of the first designers I recognized when I began learning about fabric collections and those who created them. Thanks. 11th Book!! Mic Drop!! Boom! This book is pure EyeCandy and you would know it was Kim's simply from the beautiful style and color combinations of the projects! Any level quilter/crafter could pick up any of Kim's books and make a project. Thanks Kim for another fun and exciting book! Thanks Henry Glass for the beautiful fabrics! I love her work and love these prizes! Warm fall colors are my favorites! I love Kim Diehl's signature look. I can spot it at fifty paces. Her colors and combinations of piecing and applique are candy to my eyes. I took a class from her several years ago and she is so down to earth and approachable. I own all her books, too. I first became aware of Kim Diehl while visiting a shop in Utah on vacation. I love her designs and colors. They are warm and inviting and just “say” home to me. The book looks wonderful and I love the fabrics! Kim never disappoints! A beautiful book! Her sense of colors paired with her designs, make me drool! I was recently introduced to Kim's work...this book looks amazing, and I just love her fabric colors! Fall is my favorite time of the year and my favorite colors. She’s captured them beautifully in her new fabric line and in her patterns. I love Love the colors!! Kims’ use of color is second to. none, I love her work! I absolutely love Kim books and patterns! I have all her books and have made many of the quilts in them! If I don't win this book, I know I will buy it! I love Kim Diehls designs and fabrics. Being new to appliqué, even I can execute her patterns. Kim Diehl is one of my favorite designers and I not only love her patterns but also her fabrics. I NEED this prize. I have put this book on my Christmas list, Kim's books and fabric are always inspiring, with beautiful colours and appliqué. Kim has an eye for design that I care for and her fabric and colors are so inviting to work with . Would love to have her book and fabric to start any of her patterns . This one is on my list to buy if I don't win. Kim's color sense is amazing, her designs always inspiring. Her designs and use of luscious colors are just delicious! Thank you for another wonderful book of ideas. Wow! I can hardly wait to read this book. Your work is stunning! I have several of Kim’s books. Her work is absolutely beautiful and love the rich colors of her fabric. Love love your quilts, etc. am currently working on one now. The colors that u used are absolutely my favorites. Pls let me this!!! I realllllt wanted to meet you someday soon. Too many errors geesh! *realllly and pls let me win Sorry should hv edited this. How beautiful this work is! I have never seen anything from Kim that I wasn't instantly in love with! Her style just speaks to my heart. SO EXCITED TO CHECK OUT THIS NEW BOOK!!! I absolutely love Kim Diehl! All of her work is gorgeous! glad to see another book from her and I would love to win it! Thanks for this opportunity! So much awesomeness! Beautiful colors! Looks like a great book. Would love these! Thanks for the opportunity! I have purchased every one of Kim Diehl's books. They are wonderful eye candy and have provided much inspiration over the years. I fell in love with the combination of piecing and applique and love her clear explanations and directions. Looking forward to more quilts in my future designed by Kim! I think the colors represent fall so well. So realistic. Love Kim's use of color in her projects. Henry Glass and Kim Diehl pairing together is an amazing combination, coming together and creating beautiful works of art for us to behold. I love the colors Kim uses in her quilts! They say "Welcome Home". Eye candy!!!!! Wow, I love the colors. Such talent! All the projects are just beautiful! Looking forward to this book! Beautiful colors great designs for home comfort! Kim's patterns are fantastic. The colors and the designs are so beautiful and inspiring. Even if I do not make all of the patterns, I love to look through her books. I just love her vibrant and lively quilts and fabrics. I used Kim's fabrics to make my very first baby quilt for my son. I love her rich colors and textures. She will always be a favorite. I just simply love these colors! And as usual, her book is fantastic! 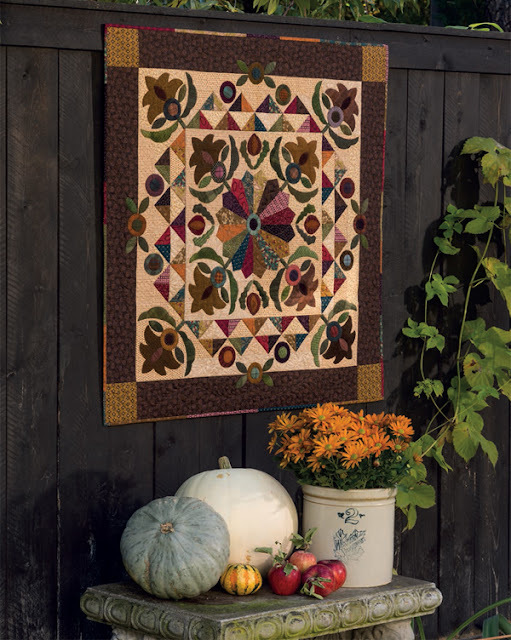 I have loved Kim's patterns since my mom introduced me to her first book. Between the 2 of us we have them all and swap books throughout the year. We both also buy her fabric and share it between us. Congratulations on another book Kim. Kim Diehl's designs are some of my favorites. I love her colors, her fabrics, and her style. Love Kim Diehl's books, fabrics and quilting projects. The colors of the fabrics are so lovely. Definitely plan to get this book to add to my collection of her books! Big Fan! Kim Diehl is my favorite designer! Her wonderful fabric prints and rich color palette always speaks to my soul and I am in awe how she puts them all together in the most beautiful quilted projects. I am looking forward to indulging in "Simple Harvest" as soon as possible. In the meantime, I'm satisfying my Diehl addiction with my Whatnots. Congratulations on the new book Kim, can't wait to see it! Stunning! Can't wait to try this!!! 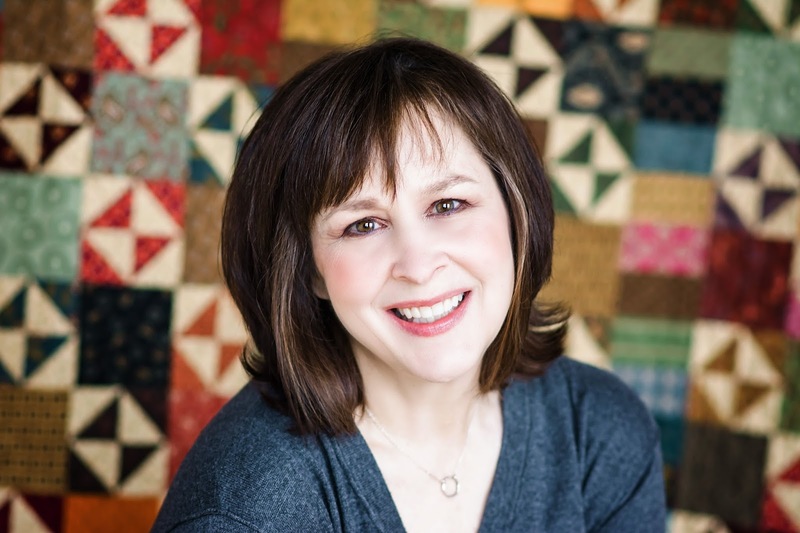 I have loved Kim Diehl books, fabrics and quilts! She is extraordinary with all the ways she uses the fabrics with a wonderful result! Keep it up Kim! The patterns and colors are stunning! I love the attention to color combos. I love the colors of her new fabric line! Can’t wait to get my hands on that book! Wonderful looking quilts! Love Kim Diehl's patterns and fabrics. I've taken a class she taught and use her tips and tricks for successful applique. Kim,I have always loved your style! Colors, designs, there isn't anything I don't love. I know this book will be another one to cherish, can't wait to get it or win It! Your fabric is to die for! Continued success for you! Kim Diehl color combos shout fall to me. PS I love fall! I love everything Kim does. Her quilts are so beautiful and her fabrics are really gorgeous. I’m new to Kim’s colors and style....it screams very comforting and homey to me. The colors are so rich. I absolutely love it!!! Kim is a beautiful quilter. This would be very fun to own! Kim has a wonderful sense of color and design, which shows so delightfully in her new book! All of the patterns are just perfect! I love the colors used and the beautiful patterns. I enjoy Kim's patterns and have made several. Her books are lovely in themselves...eye candy! Kim’s designs and the Henry glass fabrics give me a warm, cozy, home feel. Thank you. So very beautiful and fall-y!